All participants must be at the main transportation staging point in Chicago by 7:30 am for the transportation from Chcago to the start of RAGBRAI. Click Here for more information. 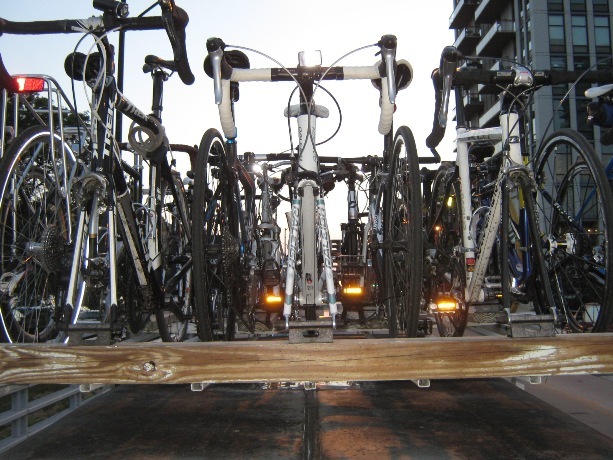 Our transportation service will transport you, your bike, and your baggage from downtown Chicago to the start of RAGBRAI and from the end of RAGBRAI back to downtown Chicago. One way transportation is also available as well as transportation for just you and your baggage if you will be shipping your bike instead. We have also partnered with Bubba's Pampered Pedalers to provide other charter services during the week. Our transportation service lets you experience RAGBRAI in the best way possible. Let someone else deal with the stress of driving while you relax in our comfortable vehicles and arrive at the start well rested for the ride the next day. You will be able to meet and share experiences with other riders from Chicago and beyond who are as excited about the ride as you are. Let your fun begin the moment we leave Chicago! All of our locations in downtown Chicago are centrally located and extremely convenient. They are also easily accessible by all types of public transportation (airlines, trains, and busses) whether you live in the city or suburbs or across the country or world! In fact if you travel by public transportation you may be able to enjoy your RAGBRAI vacation truly car free - no driving or parking at all! Click Here for more overall information about our travel plans. Click Here for more information about our travel plans from Chicago to the Start of RAGBRAI. Click Here for more information about our travel plans from the end of RAGBRAI to Chicago. We are an officially endorsed RAGBRAI charter service based within the city of Chicago. Our professional staff prides itself on outstanding customer service and no one knows how to support you in Chicago better than we do! We want you to know exactly what to expect by providing you as much information as possible through our website ahead of time. We want you to feel absolutely confident in our service so you can make the best decision for you and your personal travel plans. If you have any questions or need anything at all please Contact Us and we will be happy to address them! We will be frequently updating our website with the latest information so if you are interested in our transportation service please Click Here to join our mailing list so we can keep you up to date. Make sure to also indicate your level of interest in our other events and services as well! Thank you for your interest - we look forward to you joining us!